Last May, Nokia unveiled the low budget phone, Asha 501 at an attractive price tag of only $99. Nokia’s Asha series is actually aimed at the emerging markets such as those in India, Bangladesh and Latin America. The mobile phone has a 3-inch display with a QVGA resolution of 320 x 240 covered with hardened glass on the front, 3.2 megapixel camera at the rear, 1200 mAh battery power and 4GB microSD storage. 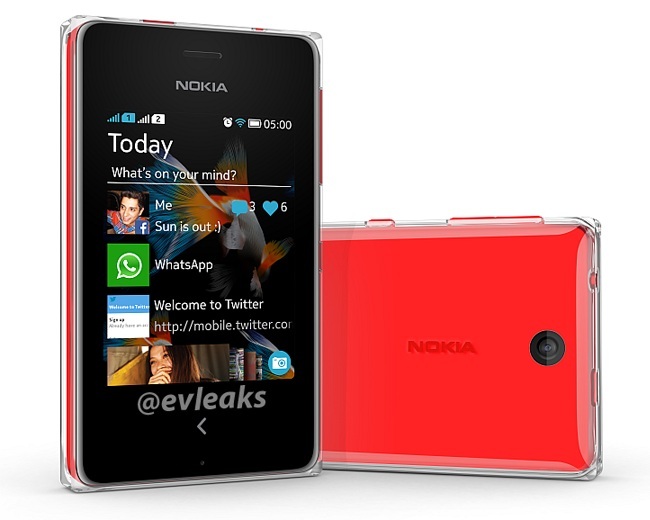 @evleaks, master of leaking potential devices have posted an image of the upcoming entrant to the Asha family, Asha 500. The device seems to carry the same design language as its predecessor but with some slight changes. Although no technical specifications have been mentioned yet, we do expect it to have upgrades. Most importantly, as Asha 501 was a single SIM version, this one however is a Dual SIM version phone as shown in the picture below. The form factor of the phone is left intact but we see the device having a translucent effect on the outer edges. Now it can be a case or might not be one but there’s a high probability that this is the final design. Another change in the device is the replacement of a physical button to a capacitive button. Nokia will be holding a press event on October 22 and we expect to see the Asha 500 unveiled along the first-ever phablet, Nokia Lumia 1520. Has Japan fallen behind in the games industry?